Leave it to me to post about a steaming soup in the break of summer. I’ve done it before (remember when I made tomato clobber in the midst of summer? ), and I’ll probably do it again. Breaking the rules of blogging and working at my own speed. So far we have made Bellingham, WA, our new home for the last 6 weeks. Working a lot, but at the same time we’re making it important to check out the local scenery and get a a lay of the land. One of the most mesmerizing things about living in the PNW is the vast amount of local eats available at a fingertips reach. Right before we moved, I selfishly thought about how we may miss a lot of the things that I loved about Cali, the multi-multiculturalism, our neighbors homegrown lemons and of course, avocados. You know, the usual stressors. But it wasn’t until really diving into the farmers markets and chatting with the locals, that I realized there is a whole sleuth of local and delicious eating possibilities here. I made this spring donabe on one of the common cloudier days in this state, but don’t let that stop you from enjoying donabe at home any time of year. If you know me, you know how intrigued I get with Asian cooking. It is the most foreign to me but the most exciting at the same time, so when Uncommon Goods asked if I wanted to partner with them and use some of their gorgeous handmade, recycled and organic products, you know I had to jump on the chance! A trip to the local farmers market inspired this seasonal take on today’s donabe. Which is what the pot is called and literally translating to ‘clay pot’ in Japanese. 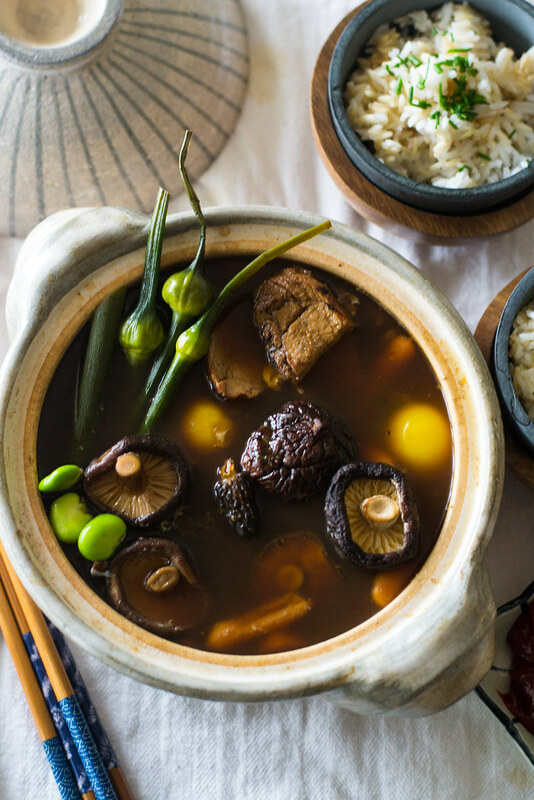 A few fresh fava beans, spring morel mushrooms and the newest addition to my taste buds, garlic scapes in which Joe describes as being a cross between a garlic and artichoke heart is what adorned this simple donabe dish. 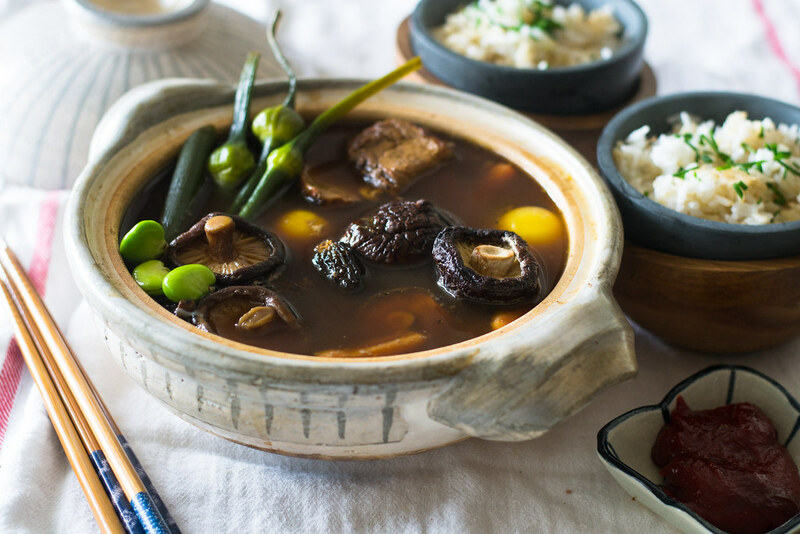 And can we just stop and bask in the glory of this gorgeous donabe pot? And those beautiful soap stone bowls…seriously, anything from their site would be such a classy birthday gift or anniversary gift and I know Joe has been eyeing these whiskey stones like no tomorrow. It’s OK, I have it mentally written down. Thank you Uncommon Goods to introducing me to your beautiful online catalog and thank you for continuing to lead the way in sustainability and showcasing talented artisans and beautiful unique gifts. This was a sponsored post with Uncommon Goods and all delicious opinions are my own. The products used in this post are Earthware Cooker and Soapstone Bowls. First place dried mushooms in bowl with 1/4 cup of warm water and allow to reconstitute. Once the mushrooms are plump and rehydrated, carefully pour and reserve the liquid but discard any dirt left over. Next, in the donabe (or you can use a regular pot), add all the broth ingredients and bring to a gentle boil. If using a donabe, note that it will boil quickly and stay hot for a while. Once broth is boiling, add in the whole eggs, carrots, garlic scapes and mushrooms and cover with the lid and allow to simmer for 3-4 minutes. Since the broth is so hot, it will cook everything pretty quickly. Once done, add in the fava beans and cooked sliced pork (or chicken, or you can keep it vegetarian) and turn off heat. 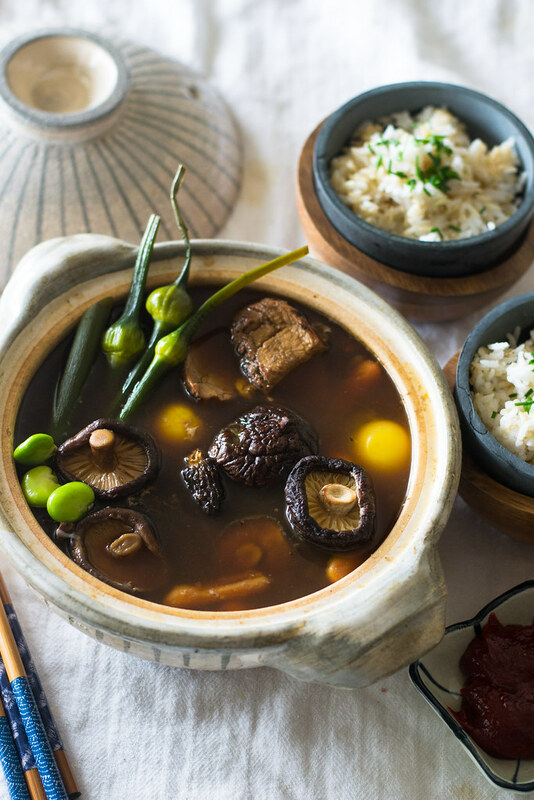 Bring the donabe to the table and serve with cooked rice and garnish with chopped chives.